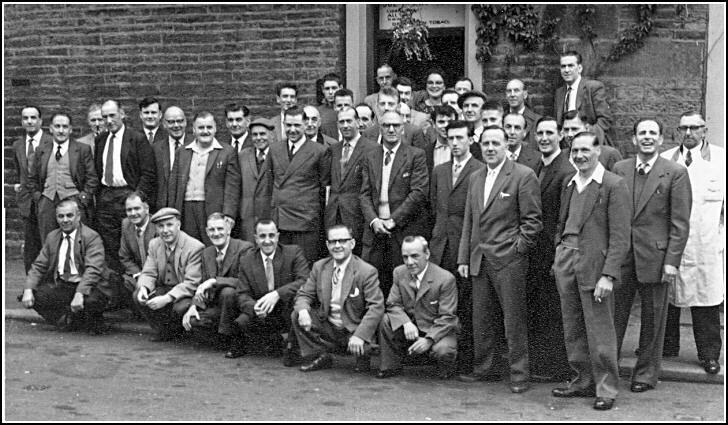 Photo provided by Chris Barsby, taken outside the Black Bull (probably in the early 60s), ready for a pub 'day out'. Includes Chris's dad Jack Barsby, John Dixon, Willy Lowe, Barrie Pearce, Joe Harry Haigh and his wife Jean. Barrie Pearce and John Dixon I am unable to identify from this picture. Those I can name are Alec Willets (2nd row 5 from the right) Michael Peat ( far left on the back about 3 in ) David Baxter next to him on the left looking sheepish and peeping round the corner. The chap next to your dad is Willie? Riley, ( known as Ready Money Riley for his dealing ability) The gent behind the one with the open necked shirt on the left is ? Hardaker, father of Philip and Colin. On the front row is Eric Seward of Sutton Cricket team fame. 3rd row. 3rd from left Harry Hardaker (Allen's Cousin) Behind Allen's Dad. Right of the door, in line with the doorpost is Alvin Whiteoak. (Allen's cycling friend). Back row: Alan Fisher, Garth Haigh, Joe Harry Haigh, Jean Haigh. Third row: Ken Greenwood, Sam Rudge, Alvin Whiteoak, Hector Watson, Frank Mullarney, Clive Garnett. Front row (squatting): Jack Barsby (not Sam), Herbert Riley, Leslie Whiteoak, J. R. Barrett, Eric Seward, Eddie Smith, Paddy Reape. The rows are a bit higgledy-piggledy so I'll try and sort out a better naming key. Some of the names don't tie up 100%, so if you can correct any names please add a message on the forum.